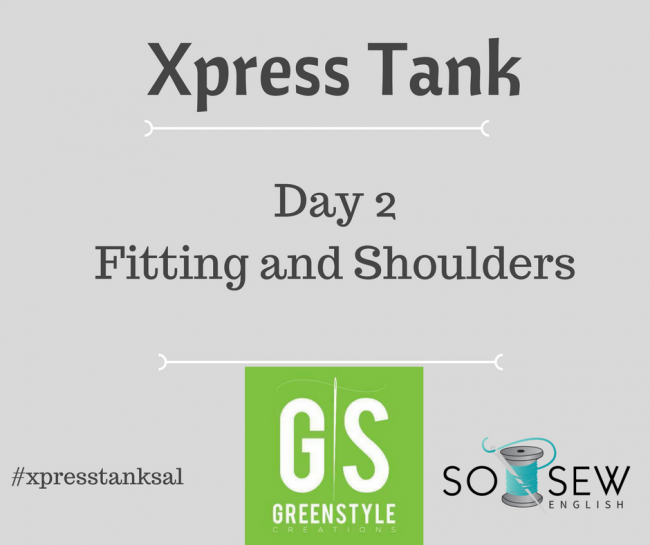 Welcome to the second day of the Xpress Tank SewAlong! This week we are taking a little time for ourselves amidst the holiday chaos (and I do mean a little- this pattern is quick!) to whip up some Xpress Tanks for the warmer weather to come. Fabric and Supplies is here! Day 1: Sizing and Cutting Fabric is here! Yesterday we discussed size and fit, pattern grading, and cut our fabric. Today we are going to sew the shoulder seams, and do a little more fitting, as needed. As I’ll explain in the video, I find that I need to take up the front and back shoulders a bit, to get a closer fit around my underarm and bust. I also have forward shoulders (thanks modern life! ), so I take a bit more from the front than the back, so my shoulder seams don’t slip backwards and affect the fit of the tank. This is a personal alteration- but by basting together your shoulder seams, you can evaluate what (if any) changes you want to make. I also often lower my neckline after taking up the shoulders, so it doesn’t get too high. Again, a personal preference- customize this tank to your body! If your fabric has some weight to it (bamboo, MVC, french terry, some athletic knits), you will want to stabilize those shoulder seams a bit so they don’t get stretched out. One way to do this is by adding fusible stay tape to the wrong side of the back shoulders before sewing the shoulder seam. I use this stuff from amazon. Another way to do this is by adding clear elastic into the seam as you sew/serge it. Here’s a short video on how I do that. The example is serging elastic into a leggings waistband, but the technique is the same. This is a good habit to get into when you are making athletic wear, t-shirts, even knit dresses- adding extra reinforcement to key seams in these garments is common practice in RTW, and will extend the life of your handmade garments. That’s it for today- super quick, right? Let me know how you’re coming along, and don’t forget to share your finished items with me on Facebook and Instagram!